← From Sketch to Scarf: Tea Party! WIWT: My funny bunny shoes! I bought these shoes in Hong Kong. I think they were in this mall on the Kowloon side called “Trendy Place,” but I can’t remember for sure. They were a bit small, but the lady tried to stretch them for me while we shopped. They were on sale for like $30 USD. I can’t say that I love the outfit I wore them with…but I am still figuring out how to make them work in my wardrobe hehehehe. I feel really comfortable in platform shoes that have an angle, but I feel like platforms that are just one big sponge of equal height make me feel like I’m waddling when I walk. I can’t really explain it, but it’s one of the reasons I avoided flats for a very long time. I spent most of the early 2000’s about 3-4 inches taller than my normal self every day. Sorry for the lack of blogging! I have been living in a bit of a boring black hole lately, just trying to wrap up projects on my to-do list, plan for Valentine’s Day items, and avoid taxes and accounting (can’t do that for much longer, though). I also spent a few days working on a super cute but super TOP SECRET project for a friend. I can’t wait to show you pics of that. Oh you are gonna love it. But it can’t be revealed yet for a few weeks! 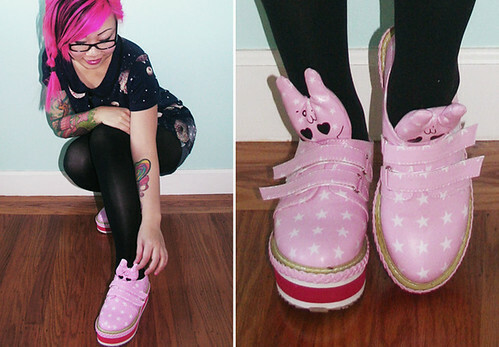 14 Responses to WIWT: My funny bunny shoes! Oh my gosh, totally in love with those shoes! I’ve never worn platforms before, they look uncomfortable, but maybe I’ll have to dash that fear. I think it really depends on the platform! Some of them make you feel really wobbly and unstable, but some are perfectly comfortable! It’s always nice when the toe area has some kind of roll or angle, so you’re not clomping around like Frankenstein! omg the shoes!!!! drool!!! pink!!! I have this feeling I will never wear them! Aw, thanks, Jenny! It’s actually been a hard year, and frustrating, business-wise. Hope this one is better! Can’t seem to see the photo 🙁 But they sound epic cute!!! Hmmm that’s weird!! Maybe Flickr was being weird for the moment you tried to see the photo! Those are seriously the cutest shoes I’ve ever seen. I wish I could hop a plane to Hong Kong and get a pair for my little sis. She would pretty much die. I keep thinking about selling them. Not sure I’ll actually wear them enough to justify keeping them, but I’ll give it a few months!